2010-11-24 Boeing has responded to an Air Force / Ministry of Defence Request for Proposal (RFP) for 22 attack helicopters and has offered the Boeing AH-64 Apache Longbow attack helicopter platform for this requirement. The Indian Air Force has conducted field trials for the Apache Longbow helicopters, which offer a range of capabilities including lethal attack, peacekeeping, reconnaissance over land and sea. "We responded to the RFP for 22 attack helicopters for the Indian Air Force with our Apache Longbow helicopters and completed field trials this year. The Apache Longbow is the only available combat helicopter with a spectrum of capabilities for virtually any mission requirement. We believe it is uniquely suited to meet the commander’s needs – including reconnaissance, security, peacekeeping operations, and lethal attack -- in both land and littoral environments -- all without reconfiguration. 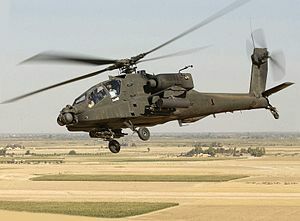 The Apache is a versatile aircraft capable of meeting the needs of operators in both military and paramilitary markets."